Product prices and availability are accurate as of 2019-04-18 05:55:33 UTC and are subject to change. Any price and availability information displayed on http://www.amazon.com/ at the time of purchase will apply to the purchase of this product. 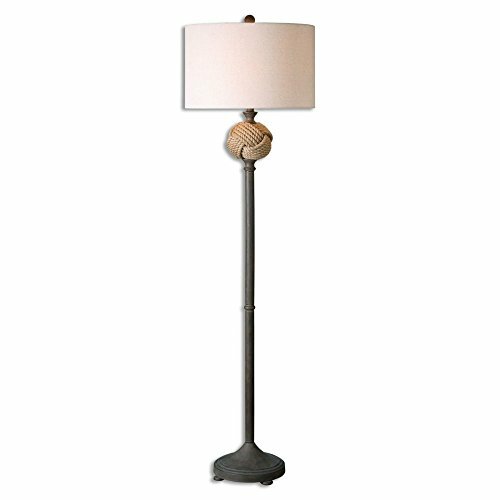 The Uttermost Higgins Floor Lamp blends industrial style and nautical together thanks to a woven rope sphere accenting the top combined with a rust brown metal finished stand. A round hardback drum shade made of light beige linen is enhanced with natural slubbing for a unique, distressed look. Overall measurements: 17W x 17D x 62.25H in.. Shade dimensions: 17W x 17D x 10.5H in. (Top), 17W x 17D in. (Bottom). Natural rope base. Beige linen fabric shade. Requires one 150-watt bulb (not included).